Rather than allow the establishment press to be the nation's lone voice on the U.S. economy — predictably chortling that it "has rebounded with vigor" after one supposedly good quarter showing 4 percent annualized growth — let's take a look at what else the government's Gross Domestic Product data released Wednesday revealed. 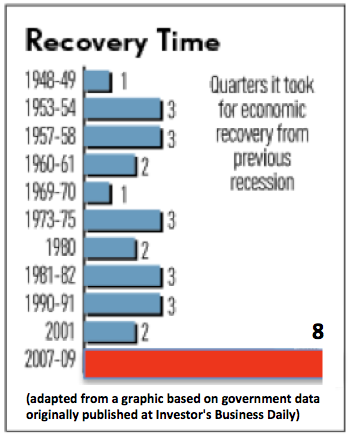 In addition to disclosing that the first quarter's contraction, at an annualized 2.1 percent, was not quite as awful as once thought, the Bureau of Economic Analysis's comprehensive revisions to previously published annual and quarterly GDP data reconfirmed that the economy during the first four years of the Obama "recovery" underperformed every post-downturn economy since the Great Depression by a wide margin. Most people know that, or should — and if you don't, here's the proof. Beyond that, BEA data now show that Obama's post-recession economy put in a performance worse than that seen after the Great Depression itself.